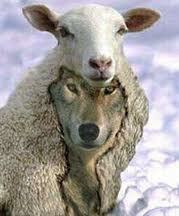 False teachers are WOLVES according to Paul. They are predators who prey upon the sheep. Their purpose is to lead believers away from the truth. They twist and pervert the scriptures in a way that corrupts the gospel, which, believe it or not, has historically led to immense human suffering. When I was writing my book to counter the arguments of the late Christopher Hitchens, I was floored to discover a repeating pattern in history: Wrong doctrine is the source of most of the suffering in history. This wouldn’t be much of a discovery if I was saying that people of other religions, or atheists, were the cause of so much suffering (even though that would be true), but what I discovered was that the CHURCH was a great source of suffering also. In fact, this is the argument of the atheists. They claim the church has been the cause of much evil. I just couldn’t accept the argument from some apologists (such as Dinesh D’souza) that said, “Well, yes, we Christians have done some horrible things, but you atheists have done A LOT MORE EVIL than we have.” Instead, I think the church should be the source of all good things, not the source of both good and evil. WHEN THE CHURCH GOES ASTRAY FROM THE TRUTH AND EMBRACES FALSE TEACHINGS, THE WORLD SUFFERS. There’s a reason why the church is called the salt of the earth. Salt is a preserver, but if it loses it saltiness, it no longer has the power to preserve. How does salt lose its saltiness? The chemical composition of salt (sodium chloride) can’t be changed or weakened, but it can become impure by blending it with other chemicals. The church that has lost its saltiness is the church that has blended the gospel with other sources of truth! Let me demonstrate this in history. The early church, in its most pristine state, under the guidance and teaching of the apostles, was a force for good the world had never known before. They cared for the poor and the sick, redeemed slaves, opposed the tyranny of the Roman emperors, and spread the love of God and his good news for humanity around the world. They were challenged by the Gnostics and other false teachers, but they were still kept pure by the sound teaching of the apostles. As time went on, some of the early church fathers, such as Clement of Alexandria and Origen, began to blend the teachings of Jesus (who they characterized as the “logos”) with the teachings of the Greek philosophers. Thinking they could make the gospels more palatable to the Greeks, the synthesis began. Over time, the teachings of the Greeks would hold as much sway over the church as the teachings of the Bible. One of the most surprising results of this synthesis between the gospel and the Greeks was the negative impact on science. For example, if the church would have kept the gospel pure, they wouldn’t have gotten into a dispute with Galileo over Aristotle’s geocentric view of the universe. The Catholic Church’s rejection and persecution of Galileo is one of the events that prove that the church is ignorant, and therefore not able to be trusted, in the eyes of the atheist community. In other words, the impure teaching of the church led to an excuse for people to reject Christ. It was false teaching that led to the inquisitions of medieval Europe. Do you think it was part of the teachings of Jesus to drill people under the threat of torture and punishment? Where do you find that in any of the gospels or epistles? The laws governing the inquisition, issued through a papal bull by Pope Innocent IV (ad extirpanda) didn’t mention one scripture. The papal bull of Pope Innocent VIII concerning witchcraft in Germany had references to preaching the Word, but again, not one scripture was held up as a support for their actions. Instead of loving their enemies as commanded by Jesus, this church disobeyed and murdered their enemies in the name of God, giving men an excuse to reject Christ. As a result of the Reformation, whose rallying cry was “grace alone, scripture alone, Christ alone, and faith alone,” along with the invention of the printing press, the Word of God began to spread throughout Europe. Its truths began to permeate society and impact education, politics, science, and economics. The people rejoiced at Luther’s message of grace and the world was blessed. But when Calvin went beyond teaching the scriptures and tried to set up his New Jerusalem in Geneva, I believe he went too far. His people were burdened and tyrannized. They lived under a spiritual despot who tried to control their dressing, eating, and sleeping habits. He burned Servetus at the stake in the name of the “Father, Son, and Holy Spirit!” This was because he didn’t keep the gospel pure. He disobeyed Jesus and tried to set up the kingdom of God in this world, and the results have given men a lasting excuse to reject Christ. Southern slavery was another example of the church going astray. They abandoned the teachings of Jesus and Paul concerning freedom and enslaved men for their own purposes. The Christian abolitionists such as William Wilberforce, Frederick Douglass, and William Lloyd Garrison, cried out against this abuse of humanity, using the scriptures as their authority, but the southern churches rejected these prophetic attempts to call them back to God, and as a result war ensued. The disobedience of Christians and their unwillingness to love the gospel of the One who came to set the captives free, led to immeasurable suffering. The southern slaveholder who put men in chains in the name of God has given a lasting excuse for men to reject Christ. The willingness of the church of the Victorian era to blend Darwinism in with the gospel led to the abuse of the “darker races” who had now become the “white man’s burden” due to the ideology of social Darwinism as promoted by “Christians” such as Josiah Strong, William Graham Sumner, and Henry H. Johnston. This corruption of the gospel led to the outcry against “colonialism.” Evangelical missionaries tried to counter this wrong doctrine. President Benjamin Harrison was one of those who opposed the Darwinistic corruption of the gospel. Helen Barrett Montgomery, William Howitt, and John Mackenzie, just to name a few, also fought against social Darwinism, but to this day the Christian church is accused of causing men to suffer under “imperialistic abuses.” This false teaching has given many men an excuse to reject Christ. Karl Marx used these imperialistic abuses as an excuse to oppose “Christendom.” The robber-barron industrialists who believed it was their destiny, as members of the white race, to order the world and cause it to “progress” (a doctrine of evolution), and rationalized their “survival of the fittest” ideology to take advantage of the poor, led him to develop a hatred for capitalism. Unfortunately, he described the efforts of these uncaring “bourgeoisie” as “exploitation, veiled by religious and political illusions.” (The Communist Manifesto) The willingness of a portion of the church to corrupt the gospel and blend it with Darwinism contributed greatly to the development of Marxist philosophy! When the church goes astray, when it has lost its saltiness and is no longer pure, the world suffers. How many millions were tortured, imprisoned, and murdered because Marx saw an impure Christianity? Marx was also influenced by the work of German historical critics such as Ludwig Fuerbach and David F. Strauss. Fuerbach, a student of Georg Hegel, wrote the book, The Life of Jesus, claiming that the supernatural claims of Jesus were mythological and that Jesus was merely a good teacher. The historical critics cast doubt on the reliability of scripture, holding the Word up to the standard of known history, archaeology, and science, rather than vice versa. This led Marx to doubt the Bible and claim that Christianity was the “opium of the people” which dulled their worldly pain and made them satisfied with obtaining a just world in the “by and by” rather than rebelling and creating it now. Christendom was effectively cut in half by the historical critical movement. This was where the conflict between liberal and conservative Christianity was birthed. Marx was influenced by false teaching of the type that came straight from the serpent’s mouth, “Did God say . . . .?” and it caused untold suffering to humanity in the 20th century. Incidentally, this theological movement started in Germany. Because the German church no longer embraced the Bible as the truth, they were willing to embrace other forms of “truth,” such as science and philosophy. Nazism was a blend of the “scientific” social Darwinism and the philosophy of Hegelianism, which blended Kant’s “categorical imperative” and Herder’s “expressivism.” Both social Darwinism and Herder’s expressivism were based on racial theories. This led to the genocidal extinction of the Jews. The only organized opposition to this ideological mess was the evangelical “Confessing Church” led by Barth, Niemoller, and Bonhoeffer. Thank God for their prophetic stand on the Word of God, as they outlined in their “Barmen Declaration.” A large swath of the German church had lost its saltiness because they refused to keep the gospel pure. How much did humanity suffer as a result of the church rejecting sound doctrine? This shameful abandonment of the pure gospel by the German church, who placed Nazi swastikas on their altars, has given men a reason to reject Christ. When Paul talked about wolves coming into the church, he wasn’t exaggerating! The horrible truth is that when the wolves get into the church they are also let loose on the world. We are the gatekeepers to humanity. We must love and obey the pure gospel of grace and truth or we lose our saltiness and the suffering begins. The doctrines of Jesus Christ are not only intellectual or spiritual playthings, they are the precious truth that blesses the world, and when the church abandons the gospel of grace and truth and embraces the wolves who bring false teaching, it has essentially abandoned humanity and opened the gates of hell, giving men another reason to reject Christ. Previous BILD International and the Antioch School–Moving the Church Away from Pure Grace?